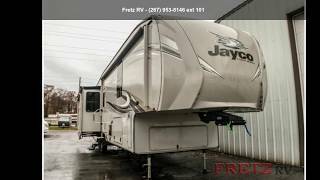 Hi, I am interested in your 2018 JAYCO Eagle (stock #15435) listed on Autotrader for $49,995. I'd like to get more information about this vehicle and confirm its availability. Jayco Eagle 336FBOK5th wheel highlights: Attic/Loft Automatic Leveling Jacks Bath and a Half Kitchen Island Outside Kitchen & Entertainment Center w/TV Grill, Refrigerator w/Power Awning Slide Toppers 2nd A/C King Bed 2 Power Awnings Base Remote - Operate Lights Slides If you have been looking for a unique fifth wheel with abath and a half, this Eagle 336FBOK has you covered! Imagine your own front bathroom with a walk-in closet, wardrobe, and a space prepped for a washer and dryer. You have plenty of storage throughout including inside the chest, overhead cabinets,residential-style walk-in pantry, and in theattic/loftabove the half bath. You can eat and play cards at thefree-standing dinette,clean dishes in the sink on thekitchen island, andwatch TV while visiting with friends on thetheater seatsor tri-fold sofa. The LED fireplace will keep you warm during the cooler months, and theceiling fanwill keep you cool during the hotter months. Come see why everyone enjoys traveling in an Eagle. Each Jayco Eagle offersTuffShellexterior walls, a Magnum Truff roof system, and Climate Shield zero-degree-tested weather protection for four seasons of traveling. You will find independent satellite and whole-coach cable hookups,dual USB charging portsin the kitchen and bedroom, and 12V charging stations for your electronic needs. You will love the features on the mandatoryCustomer Value Packageand theLuxury Packageincluding handcrafted, glazed, raised-panel Maple cabinet doors, soft-close residential kitchen drawers, a LG solid-surface kitchen countertop, and the list continues. Come experience luxury and comfort while on the open road in an Eagle. Fretz RV is a top dealer for all 2017, 2018, and 2019 Jayco trailers in thePhiladelphia,Pennsylvania,Delaware,Maryland,New Jerseyand New York Areas. These campers come in as Travel Trailers, Fifth 5thWheels, Toy Haulers, Pop Ups, Hybrids, Tear Drops, and Folding Campers. Brand Names Hummingbirds, Jay Series Sport Camping Trailers, Jay Feather, White Hawk, Jay Flight, SLX, Bungalows, Eagle HT, Eagle, North Point, Pinnacle, Designer, Octane, SL, Talon, Seismic, and WaveWe also carry Winnebago, Starcraft, and Crossroads trailers. We also carry used and Certified Pre-owned RVs like Forest River, Mobile Suites, DRV, Redwood, T@B, Dutchmen, Keystone, KZ, Grand Design, Casita, Scamp, Cougar, Montana, Raptor, Springdale, Passport, Salem, Catalina, Coachmen and Airstream, and are always below NADA values. We take all types of trades.When it comes to RVs, we are your full service stop.We can provide you with rapid RV Insurance quotes with minimal information.We have an RV rental program to serve your short term RV needs. We have detailed videos on RV Trader, RVT, Classified Ads, eBay, and Youtube. Like us on Facebook! Serving all areas of the world! Check out our great Google and Dealer Rater reviews at Fretz RV. We are located at 3479 Bethlehem Pike,Souderton,PA18964215-723-3121. Start Camping now and see the world. We pass RV savings Direct to you!